It sure ain’t Spring yet. So, I keep looking for great healthy and hearty recipes to warm up to on the weekends. This recipe for Baked Eggplant Parmesan was a great find and extremely exceptional. This is not the super heavy and greasy eggplant parmesan you are used to at the cliche Italian restaurant. This recipe is time intensive but healthy, just as crispy as the traditional fried, savory and light. I really encourage you to make it! 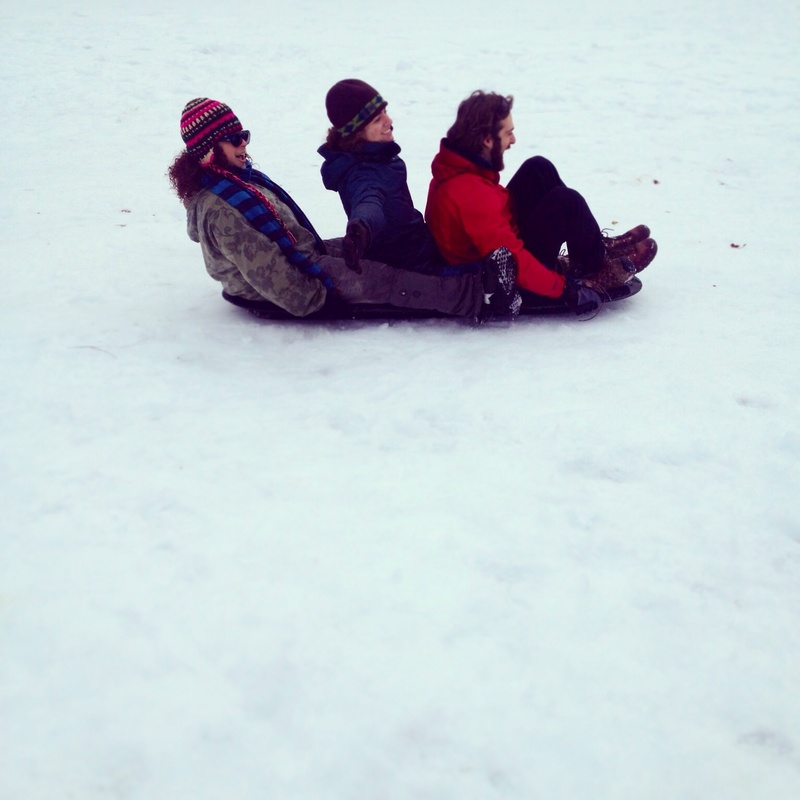 Keep up the momentum and get sledding to spring! FOR THE EGGPLANT: Toss half of eggplant slices and 1 1/2 teaspoons kosher salt in large bowl until combined; transfer salted eggplant to large colander set over bowl. Repeat with remaining eggplant and kosher salt, placing second batch in colander on top of first. Let stand until eggplant releases about 2 tablespoons liquid, 30 to 45 minutes. Arrange eggplant slices on triple layer paper towels; cover with another triple layer paper towels. Firmly press each slice to remove as much liquid as possible, then wipe off excess salt. While eggplant is draining, adjust oven racks to upper- and lower-middle positions, place rimmed baking sheet on each rack, and heat oven to 425 degrees. Pulse bread in food processor to fine, even crumbs, about fifteen 1-second pulses (you should have about 4 cups). Transfer crumbs to pie plate and stir in 1 cup Parmesan, 1/4 teaspoon salt, and 1/2 teaspoon pepper; set aside. Wipe out bowl (do not wash) and set aside. Combine flour and 1 teaspoon pepper in large zipper-lock bag; shake to combine. Beat eggs in second pie plate. Place 8 to 10 eggplant slices in bag with flour; seal bag and shake to coat eggplant. Remove eggplant slices, shaking off excess flour, dip in eggs, let excess egg run off, then coat evenly with bread crumb mixture; set breaded slices on wire rack set over baking sheet. Repeat with remaining eggplant. Remove preheated baking sheets from oven; add 3 tablespoons oil to each sheet, tilting to coat evenly with oil. Place half of breaded eggplant on each sheet in single layer; bake until eggplant is well browned and crisp, about 30 minutes, switching and rotating baking sheets after 10 minutes, and flipping eggplant slices with wide spatula after 20 minutes. Do not turn off oven. FOR THE SAUCE: While eggplant bakes, process 2 cans diced tomatoes in food processor until almost smooth, about 5 seconds. Heat olive oil, garlic, and red pepper flakes in large heavy-bottomed saucepan over medium-high heat, stirring occasionally, until fragrant and garlic is light golden, about 3 minutes; stir in processed and remaining can of diced tomatoes. Bring sauce to boil, then reduce heat to medium-low and simmer, stirring occasionally, until slightly thickened and reduced, about 15 minutes (you should have about 4 cups). Stir in basil and season to taste with salt and pepper. TO ASSEMBLE: Spread 1 cup tomato sauce in bottom of 13 by 9-inch baking dish. Layer in half of eggplant slices, overlapping slices to fit; distribute 1 cup sauce over eggplant; sprinkle with half of mozzarella. Layer in remaining eggplant and dot with 1 cup sauce, leaving majority of eggplant exposed so it will remain crisp; sprinkle with 1/4 cup Parmesan and remaining mozzarella. Bake until bubbling and cheese is browned, 13 to 15 minutes. Cool 10 minutes; scatter basil over top, and serve, passing remaining tomato sauce separately.